Tea at Tiffany’s – actually the very lovely Warren House! New York is my all-time favourite city and my ‘happy place’, but I love my home in leafy Surrey, too. My Holly Golightly-inspired outfit – and Cat! 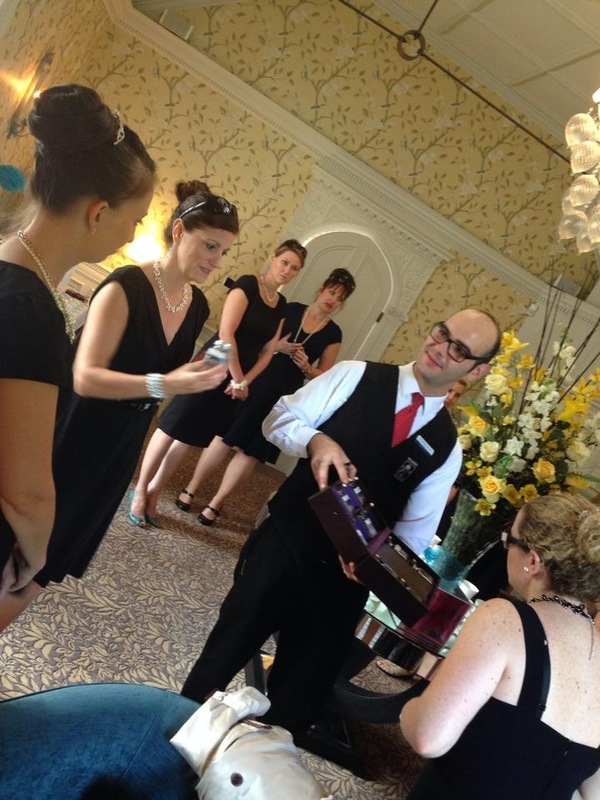 My lovely friends at The Secret Tea Society, also huge fans of both Breakfast at Tiffany’s and Audrey Hepburn, recreated the magic of the film and paid homage to the wonderful Audrey in a Breakfast at Tiffany’s-themed afternoon tea, right here in lovely Surrey! 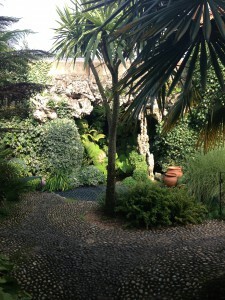 The stunning secret grotto garden! I was so excited to put on my little black dress (a cute little number from Anna Sui, bought especially for the occasion and based on the outfit that Holly Golightly wears when she visits Sing Sing); my black patent kitten heel Jimmy Choos (appropriately purchased in Saks Fifth Avenue during my visit last June) and some fabulous jewellery (a very sparkly choker-style necklace bought for me by one of my lovely Sisters-in-Law a few years ago) for this most elegant of teas! I even put my hair up in a bouffant bun! Taking with me Cat (not my real cat, but a very lifelike soft toy!) and raincoat in reference to the iconic final scene of the movie, I headed over to the stunning Warren House, the venue for our special event. Greeted warmly by the lovely lady at reception and our tea sommelier for the afternoon, I headed into the stylish sitting room reserved just for the ladies of the Secret Tea Society. The sun beamed through the windows and the French doors were open onto a secret grotto – an adorable cobbled garden and fountain, which led to the statuesque grounds, where other happy guests were enjoying sumptuous afternoon teas. Choosing our Twinings loose leaf tea at Warren House – spoiled for choice! After a glass of Champagne and catching up with the fabulous Secret Tea ladies, we sat down to play a few games – a prize for the best representation of Audrey Hepburn/Holly Golightly (my lovely table-mate, Clare, won with her striking Holly Golightly party look!) and a quiz to see who knew the most fun facts about the film (my table won, naturally!) Our prize was a copy of the film and, of course, some delicious tea, from Kent and Sussex Tea and Coffee Company. Next, we chose our Twinings loose-leaf tea – I decided to try both the Darjeeling and Assam – two of my favourites and full of flavour! Then we were delighted to see the fantastic spread appear before our eyes – delicate, flavourful sandwiches, dainty, melt-in-the-mouth scones, the most amazing mini cinnamon loaves, tempting cakes and sweet treats. After stuffing ourselves happily with as much as we could manage, there was stll plenty left to take doggy bags home! We also each took home some of the beautiful decorations that our “Hostess With the Mostest”, Founder of the Secret Tea Society, Claire Worrell, had lovingly made: Tiffany-blue-green pom-poms, ladylike table flowers adorned with Tiffany-style ribbon and pearl decorations, matching feathers and shiny butterflies! I have mine proudly on display next to my Tiffany-coloured heart chalkboard in the kitchen. What a wonderful way to spend an afternoon! I had such a good time, and it was tremendous fun not only seeing all my lovely Secret Tea friends again, but seeing everyone in their fabulous outfits. I also cannot recommend Warren House and the incredible team there highly enough.